DON’T RUIN ANY MORE OUR PARLIAMENTARY DEMOCRACY DR. SINGH; QUIT. Dear Prime Minister Dr. Singh, please quit. The way you are busy in collecting support to sustain the confidence motion has already ruined peoples’ confidence in you. Media, both print and electronic, have hit Indians hard with reports of how MPs are being considered as price-tagged commodities whose cost vary from one to hundred crores of rupees in transaction of the vote of confidence that you need so badly to stay in power. TV channels have wrecked havoc on our collective sense of democratic decency by focusing even on the dishes you offered in dinner to MPs who support you. If you perchance win the vote of confidence, you will continue to be devoid of the confidence of the peoples of India who hereafter will never believe that you won the number game in the House by virtue of probity and principled support. Along with you, every Member of Parliament, who notwithstanding not belonging to UPA would support you, will also be looked at askance by the people, even though they might not be carrying any visible price tag and even though in reality they might have been above horse-trading. You have dragged our democracy to such a devastative mess! 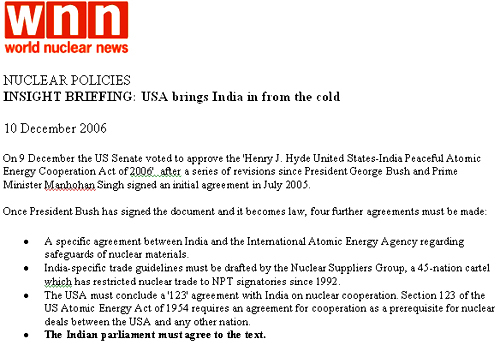 This displayed portion of American “INSIDE BRIEFFING” clearly shows that advancing in the nuke deal matter was dependant on the prerequisite that “Indian Parliament must agree to the text” of the Hyde Act and the123 Agreement generated by this Act. You kept this prerequisite hidden from the Parliament and the peoples of India. You should have accepted the prerequisite and placed the “text” of the Hyde Act and of the 123 Agreement before the Parliament and asked the members to “agree (or disagree) to the text” thereof and acted accordingly. It could have shown you as a duty bound democrat; but you did not do it. Why? Only you and your cohorts know. And, by not doing this democratic duty, you have dragged the country to such a crisis that political flesh has become a tradable commodity and the MPs have become objects to mock at. Please don’t ruin parliamentary democracy any more and quit.